Hi-Tech PMR has developed an advanced laboratory specifically and meticulously designed for precious stones recovery from jewelry, carrying out our commitment to best serve our clients’ demands and provide the highest value to them. We serve thousands of Jewelers, Diamond Dealers, and Pawnbrokers with stone removal services in the most efficient and fast pace in the industry. 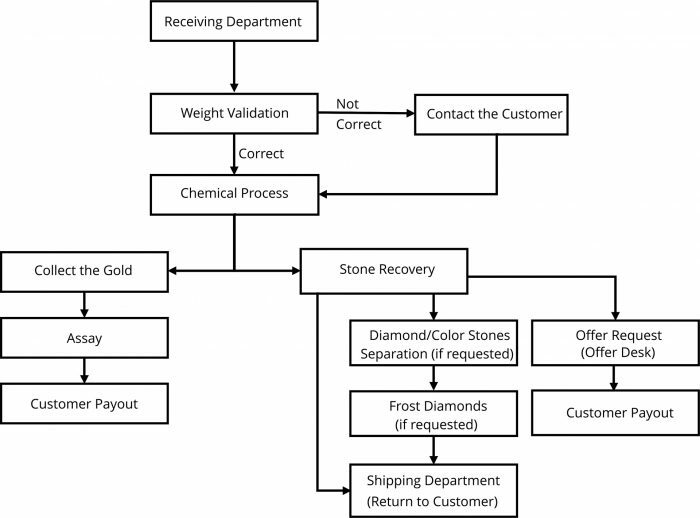 Our chemical based process extracts stones from all different precious metals without damaging or stressing the stones. Our Stone Removal laboratory utilizes the latest and most advanced methods and equipment. Following ISO procedures throughout every step ensures the validity and correctness of our process. Our highly qualified Stone Removal specialists process each lot in the most efficient way in a secure and monitored environment to guarantee customer’s satisfaction. We are dedicated to providing a stone removal experience that is unmatched in the industry! Highly secured environment with complete tracking through every step of the process from receiving to delivery. Assistance in arranging an insured shipping label. Offer on stones will be provided only upon request. Our in house Diamond Division with experienced gemologists will provide you with the most aggressive offer possible, saving you time while getting great value for your metals and stones.